We've previously covered quite a few of the Mog books here on ReadItDaddy and it's quite sad to know that Judith Kerr's 'Mog' books came to an end back in 2003 with this book, "Goodbye Mog". It deals with one of the stickiest subjects a parent (or indeed a pet owner) will have to deal with - the eventual death of their beloved pet, more a member of the family than just an animal. In the case of Mog, Kerr deals with the subject of death in an extremely sensitive way without delving into concepts too weighty for children to understand. Though Mog's family are distraught when she dies at the very start of the book (it's not exactly a spoiler to tell you this, the book is called "Goodbye Mog" after all, and does feature a rather ethereal looking Mog on the front cover!) but Mog sticks around for a little while to usher in the family's new pet, a rather nervous and frightened little kitten. The kitten is not at all like Mog. It's scared of everything (not just christmas trees), it doesn't like to be petted - and it doesn't even like a boiled egg for breakfast! Debbie and Nicky wonder what to do about the youngster - until Mog takes the wayward kitten under her wing. Beautifully written and illustrated, it's a fitting swansong for one of the best loved characters in children's fiction for the past 40 years or more. Goodbye Mog, we miss you. Charlotte's best bit - The kitten scratching Debbie when she first tries to pick it up. Hello, we're back from sunny Lanzarote (where the average daytime temperature crept up to 30 degrees, and we seem to have brought some of the sunshine back with us! Hooray!) and one of the first things we did was to troop down to the local library to replenish our stock of books. Already we have a book of the week, demanded more than any of the other 8 books in our stack. Step forward "Beware of Boys" by Tony Blundell. When a boy takes a shortcut through the deep dark wood and is captured by a wolf, you'd expect the story to end rather stickily with a boy in a large cooking pot. But the boy in question is a rather (too) intelligent little chap, and soon manages to turn the tables on the hungry wolf. Coming up with an ever-increasing complex list of ingredients for delicacies such as boy cake or boy pie, the wolf is soon hoisted by his own petard in rather humorous fashion. It's easy to see why this book is so popular with Charlotte and why it's become something of a cult classic (spawning a series of similar "beware of" books by the same author / illustrator. Kids love lists. Kids love craziness. Kids love mess and jumble and chaos and disorder and all those things feature heavily in this rib-tickling book. I have to admit feeling more than a little sorry for the wolf at the end of this book! Daddy's favourite bit: The rather hang-dog (wolf) expression on the wolf's face when he forgets the vital ingredients again and again. 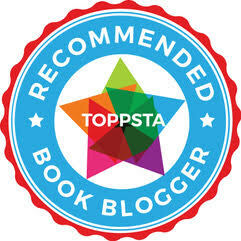 Rating: 5 out of 5 stars, book of the week! Easter is coming and as I mentioned in my previous post, there are better ways to celebrate Easter than scoffing chocolate eggs and hot crossed buns even if you're not into the religious side of things. 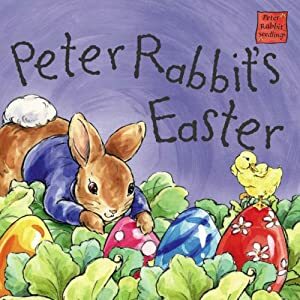 So with that in mind, here's a top ten list of books with an easter theme to entertain your kidlings over the next couple of weeks. 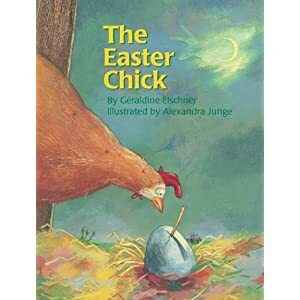 An exceedingly clever hen outwits a rather clumsy and silly fox in this timeless classic (which recently celebrated its 40th anniversary - yep I even remember it from when I was knee high to an easter chick myself). Love the 70s-style illustrations and the whole story plays out with the minimum of text, letting the fantastic pictures weave their own story. If you've never read this, you owe it to yourself to read it to your children, it's absolutely superb. 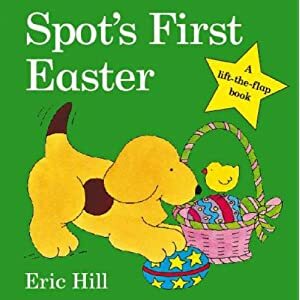 This is a nice sturdy board book for younger children who will probably already know all about Spot and his mischievous antics. 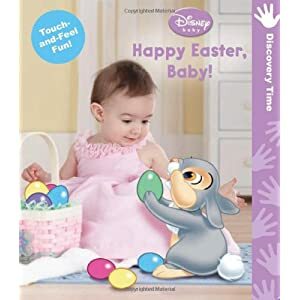 The puppy's first easter is filled with eggs and chicks and the lift-the-flap bits are sure to entertain younger readers discovering books for the first time. It doesn't taste quite as nice as a cadbury's creme egg but it is at least chew-proof! 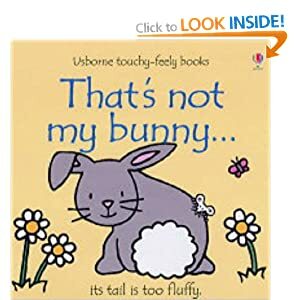 Just about every child must've encountered at least one of the "that's not my" books as there are so many of them. 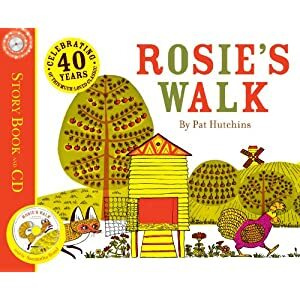 This one is filled with lots of touchy-feely textures and simple illustrations, again more suitable for the younger child who is taking their first faltering steps with books. A nice sturdy book, beautifully put together but hunt around for the best price as they tend to be a bit on the expensive side at RRP. A mother hen lays an egg, and patiently waits for it to hatch. What emerges? The Easter Chick but the little mite isn't quite what the mother was expecting. This entertaining tale is beautifully illustrated by Alexandra Junge and it's a nice snuggly and humorous book to settle down with at nap times. Quite hard to get hold of but if you spot a copy, it's well worth having. 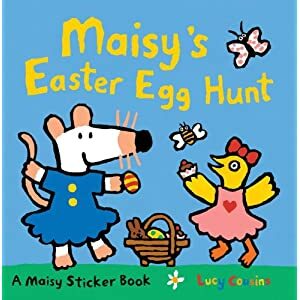 Maisy the Mouse is a children's favourite and in this innovative sticker book you can help Maisy as she goes on an easter egg hunt (with a little help along the way from her friends). Lovely simple illustrations and bold colours also serve as a good point of reference for arty children who love drawing their own easter pictures. The recent range of Peter Rabbit "seedling" books are based on the classic works and characters of Beatrix Potter. Bold child-friendly illustrations replace Potter's original (and sublime) drawings, which is a bit of a down side but these are colourful and cheerful. Join Peter Rabbit as he hunts for chocolate treats in the vegetable patch. Again, a sturdy board book suitable for younger readers but good fun and a good introduction to the world of Beatrix Potter. 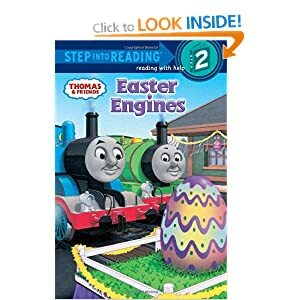 Part of the "Step into Reading" range of early readers books, Easter Engines sees Easter in on the Island of Sodor with everyone's favourite old chuffer, Thomas the Tank Engine. Thomas is sworn to protect the huge easter egg that forms the centre piece of celebrations on the island. Can he manage it without mishap? Find out in this Level 2 book filled with simple repetitive text to help young readers find their feet with reading. The Usborne 'Craft' books are absolutely fantastic for busy children who love making and sticking. 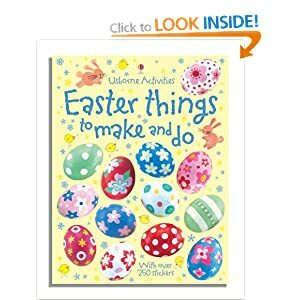 With over 250 easter-themed stickers to use on cards and designs, and a ton of fantastic ideas for easter makes, this book is brilliant if the weather takes a turn for the worst and you can't get out and about with your kids this easter. They'll enjoy painting eggs, making cards and producing all sorts of goodies from simple and easily obtainable items. Absolutely fantastic. Another Usborne book and again this time meticulously detailing scrumptious and delicious recipes your children can try out over easter. Sweet and savoury items are very easy to make from the recipes provided, and the book is beautifully illustrated and produced. 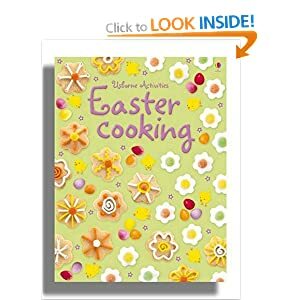 If you fancy your hand at making easter-themed sweets or even hot crossed buns, this is a great little (wipe proof) book that has tons of mouth-watering fare to enjoy over the easter period. Easter is coming, how's your waistline? Ask any child what's happening a week on Sunday and they'll probably blink a couple of times and shrug their shoulders. Mention "Easter" and their reaction will be entirely different. To most children, easter means one thing - Chocolate, and lots of it. 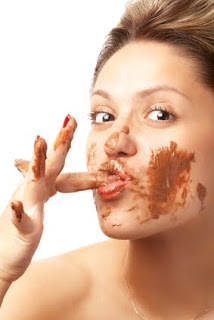 1) A recent scientific study has shown that during a typical Easter period, an average child will receive over thirteen easter eggs, and scoff their way through over 12,000 calories of chocolate and easter goodies. Normally that would keep a busy child going for an entire week! 3) Most children would receive on average a whopping £24 worth of chocolate eggs. Cocoa prices are at an all time high, having risen 140% in the last year and they're set to increase further still. Increased VAT and political unrest in the main cocoa-producing countries are two of the main reasons for the rise in chocolate prices. Or you could do the book thing. Stay tuned for our top ten list of easter-themed books to entertain your children. Boing! What does the world's bounciest stuntman do on his days off? Trains and practices of course, but when a little over-enthusiastic exercise goes wrong, The Great Elastic Marvel (five times world trampolining champion) has to rely on his flexible limbs and quick wits to save him from imminent doom. This book is excellent, not just because of Bruce Ingman's child-friendly artwork (Anyone familiar with his work on The Pencil and The Runaway Dinner will know why kids love his drawings so much), but because of the build up of anticipation and excitement just before it looks certain that The Great Elastic Marvel will come to a sticky end. It's almost impossible to keep your child still while reading this, so if you're reading it at bedtime, expect them to do a triple salco and somersault before landing comfortably back on their pillow ready to snuggle. Charlotte's best bit: The Great Elastic Marvel bouncing off the canopy of a cafe. Mike the Knight Adventures - Meet Mike! Mike the Knight is a new CBeebies TV series currently airing and becoming extremely popular in a relatively short space of time. Simon and Schuster recently contacted us to let us take a look at their upcoming range of official Mike the Knight books and the first of these is "Meet Mike! ", a book that offers background details on Mike himself, the land of Glendragon, and all the wonderful characters that live there. Mike's catchphrase "Be a Knight, do it right!" is rapidly becoming something you'll hear kids uttering as they gallop around the playground pretending to be Mike or his magical sister Evie. "Meet Mike" is a great introduction to the series if you haven't already encountered it on TV. Mike is a galant little fellow, looking after his kingdom while his father is away on various quests. Mike uses his useful "Knight in Training" handbook to get him out of all sorts of sticky situations and with his trusty steed Galahad, and his two best friends Sparkie and Squirt, a pair of lovable dragons, he's always on the lookout for adventure. The Simon and Schuster book series officially launches on March 29th 2012, with further books in the range to follow later in July including more paperback titles ("Mike the Knight and the Mighty Shield" and "Mike the Knight and the Scary Dragons") as well as a sticker book and fun noise book too. The paperbacks are a little on the expensive side (£5.99 rrp) but are glossy and nicely presented with plenty of pages and content to keep young Mike fans happy. The main suggestion my daughter made was that there really needs to be a book purely dedicated to or focussing on Evie, Mike's magical sister. Hear hear! Rating - 4 out of 5 stars. Happy 25th Birthday, Winnie the Witch! It seems incredible to think that Winnie the Witch, the timeless children's classic is a mere whippersnapper. 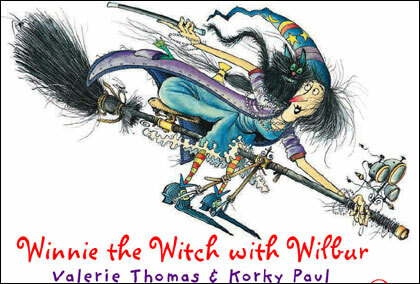 25 years ago, the perfect combination of Valerie Thomas' quirky stories, and Korky Paul's sublime scratchy ink and colour work came together to give children (and a lot of adults!) one of the greatest characters ever to adorn a book. We love Winnie the Witch to bits and look forward to reading her latest adventure "Winnie Under the Sea" very soon. The "Frog" books by Max Velthuijs are nice, simple and fun books featuring engaging animal characters, simple illustrations and always have a happy ending. So when Frog feels lost, lonely and forlorn when all his friends seem busy and preoccupied, you know things will turn out alright eventually. Max Velthuijs has a knack for putting an emotional spin on Frog's simple little life, but it's a great book with characters that stand the test of time. I don't know about you, but when I read whimsical books written in rhyme to Charlotte, it's almost impossible NOT to adopt a sort of 'sing-song' voice. Case in point: Down the Back of the Chair by Margaret Mahy and Polly Dunbar. It bounces along, telling the tale of woe of a poor family scraping their last few pennies together to fix Daddy's broken down old car. Does the answer lie down the back of the chair? Will fortune and glory be but a shuffle, a squeeze and a delve away? Well I'm not going to spoil it for you but this is a happy book full of surreal and crazy antics with superb illustrations that give children plenty to look at and find. Daddy's favourite bit - Identifying with the daddy in the story, tearing out his (nearly non-existent) hair at all the bills arriving at once.